These face covers are compatible for HTC Vive VR headset system ONLY. Made of durable PU leather, and breathable holes on the surface relieve pressure for your face skin. Soft memory foam hugs your face and feels great. Easy to install and use, soft fuzzy fabric on the back matches velcro on the HTC Vive body perfectly. Prevent the build up of dirt and bacteria with these easy to clean pads. Thinner cover (6mm) increases your field of view (FOV) by bringing your eyes closer to the lenses, and thicker cover (18mm) feels more comfortable when you use it. This HTC VR replacement face pads are covered with JARMOR parts and labor warranty for 12 months from date of the original purchase from authorized retailer and distributor. 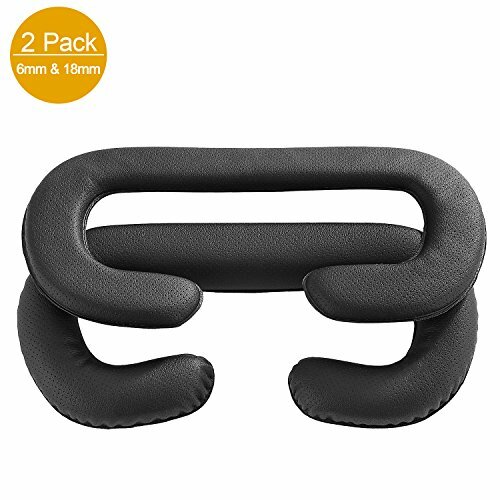 COMPATIBLE: Specially designed for HTC Vive VR headset system, 2 pack, 6mm & 18mm. COMFORTABLE&DURABLE: Made of durable PU leather, and breathable holes on the surface relieve pressure for your face skin. Soft memory foam hugs your face and feels great. 2 PACK: Thinner cover (6mm) increases your field of view (FOV) by bringing your eyes closer to the lenses, and thicker cover (18mm) feels more comfortable when you use it. EASY TO SWAP: Soft fuzzy fabric on the back matches velcro on the HTC Vive body perfectly. HYGIENE: Prevent the build up of dirt and bacteria with these easy to clean covers. If you have any questions about this product by JARMOR, contact us by completing and submitting the form below. If you are looking for a specif part number, please include it with your message.